Folkston, GA--Planning a winter trip is always iffy. The King secured a permit to canoe from the Suwannee Canal Recreation Area to Round Top and Floyd’s Island with take-out at Suwannee Canal. The plan was to cancel if the temperature was to drop below thirty. No mention was made of wind and wind chill factors. After consulting Art Shelfer, the group Weatherman, it was determined that Saturday would be cold and windy, but Sunday and Monday would be much better. Saturday night’s low would be around thirty. Seven fools--Art and Janice Shelfer, Daniel Butler, Kathy Kinder, Greg and Matt Baker, and Charlie Stines--decided to make the trip. The Bakers and Charlie drove to Folkston on Friday night, had a superb supper at Folkston’s Okefenokee Cafe, and spent the night in the Western Motel. Before six on Saturday morning Daniel Butler called to announce he would be running a little late. He and Kathy had stopped at a rest area about fifty mi les east of Tallahassee. While parked, a semi drive on too many bennies ran into the back of Daniel’s Wenonah Sundowner which was affixed to the roof of the Tahoe. The damage appeared to be fatal. Daniel and Kathy would have to return to Tallahasse and get the backup canoe, a Grumman aluminum. There was no way they could be at the put-in by the mandatory departure time of ten o’clock, but perhaps the swamp personnel would understand and allow a late start. After a Mickey Dee breakfast, Greg, Matt, and Charlie went to the Suwannee Canal Recreation Area to meet Art and Janice and to wait on Daniel. The staff was accommodating and agreed to permit a late start. No one was saying how fast Daniel drove, but he and Kathy did arrive in time to get the boats onto the water by about 10:45. E veryone was dressed appropriately for the cool temperatures, so the beginning paddle was relatively pleasant. 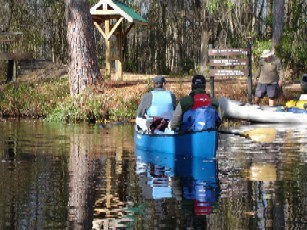 The paddle down the Suwannee Canal was typical. Truthfully, it is one of the more boring spots in the swamp. The paddlers did spot one alligator. The wind was strong and made paddling a little hard, but it was tolerable. The trees shelter the canal from much of the wind. The Coffee Bay day use shelter is just beyond five miles down the canal, and the Fellow Travelers were there a little after one. It was time for a lunch break so everyone gorged on snack foods. The resident was not to be seen this time. The weather had not warmed. Once the seven had stuffed with snacks everyone piled back into the four canoes and aimed down the canal. It wasa almost three when the cut-off to the purple trail was reached. The boats turned left into Chase Prairie. Everything changed once th e large expanse of water was reached. There were no trees to break the gusty winds and paddling was tough. Charlie found it nearly impossible to keep the solo Prism on course. It was like paddling a boat which was two feet long and sixteen feet wide. It is almost three miles from the junction of the canal to the Round Top shelter, and the canoes seemed to insist on going backward and sideways for most of the distance. Little wildlife was apparent. Finally, around four the weary paddlers saw the shelter. All were eager to get out of the boats. A large group of sandhill cranes watched as the canoes were unloaded. The difficulty was not over. Pitching the tents proved to be a task as the wind attempted to turn them into kites. It took several people to hold each tent in position as the poles were fixed and the tents erected. 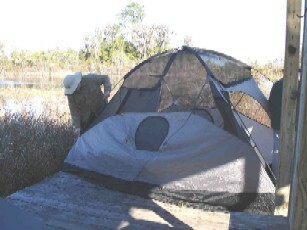 The wind tended to collapse the free-standing tents, so the tents had to be tied to the shelter poles. Daniel and Greg attempted to make a windbreak using a cheap tarp, but the wind ripped out the grommets. Greg had the honor of cooking supper. The stove had to be set behind the toilet so the flame would not be extinguished by the wind. But the meal of seafood gumbo--shrimp, crab, and oyster--was a treat. Lilliain (Greg’s imaginary wife) sent brownies, and Kathy, who is in culinary school, brought some delicious chocolate chip mint cookies she had baked. Some stayed up for conversation after supper, and others could no longer resist the call of those warm Arctic sleeping bags. No one complained of being cold once inside the tents and sleeping bags. The wind continued to howl most of the night, but died down in time for breakfast. Sunday was off to a better start. The King made coffee, and then cooked Canadian bacon and over-cooked some pancakes. The weather was rapidly improving. By about 10:30 camp was broken and the day’s journey was underway. The Sunday morning paddle was excellent. The high winds were just a memory, and the sun was shining. The group had planned to fish, but Saturday was spent struggling toward the destination. The opportunity was there on Sunday, but no one wet a hook. The prairie was alive with sandhill cranes, egrets, songbirds, vultures, and a large hawk. The alligators were out of hiding and enjoying the January sun. It is not a long trip from Round Top to Floyd’s Island. The water was high enough that paddling the canal toward the eastern landing was generally easy, although there was one submerged log which managed to catch the Shelfers. Once the landing was reached, the gang met a group of fourteen men and boys from the Atlanta area. Greg soon found that one was an insurance broker so he turned the conversation toward that subject, no doubt planning to deduct all expenses from his income taxes. 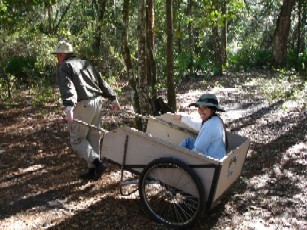 The gear was loaded onto the cart and hauled to the cabin area. Daniel and Kathy built a grand campfire which became the locus of most activity. A doe and a fawn wandered into sight but did not actually come into the clearing around the cabin. 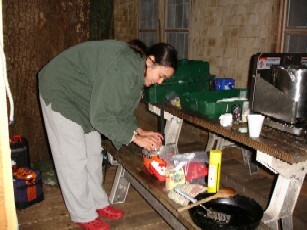 Art cooked a supper of genetically enhanced black-eyed pea stew and cooked Cherokee sweetbread in the Dutch oven. Greg brought some fruit cups, and there were still brownies and Kathy cookies for dessert. The night was warm, and the campfire was just right. The friends sat around the campfire hearing tales of Ellenton, crimes, dummy brothers, and past adventures. It was after eleven when everyone finally settled in for the night. Only the Shelfers elected to stay inside the cabin. Everyone else slept in tents outside and enjoyed the nearly full moon and the pleasant temperatures. Breakfast was Daniel’s project. He baked biscuits in the Dutch oven and grilled sausage and bacon over the open fire. Kathy cooked grits and eggs, and the eggs were yellow and clean. Eventually it was time to leave. Art and Janice decided to try out Greg’s Wenonah Spirit II, so the Bakers paddled the Gunn boat (Penobscot 17). There was no difficulty paddling out of the island. The temperatures were reaching into the seventies on the return trip. 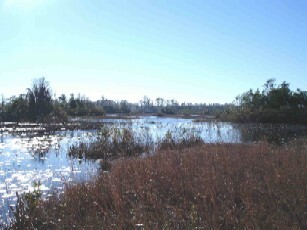 The paddle back to Suwannee Canal from Floyd’s Island is a long one, but it is not difficult. 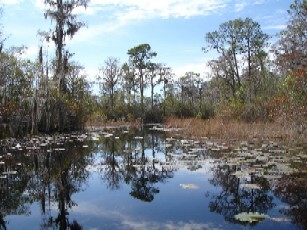 The paddlers observed more cranes, ducks, alligators, and a variety of other birds. There was a rest stop at Coffee Bay, and it was nearly five by the time the paddlers reached the take-out. All left tired, dry, and satisfied that Sunday and Monday made up for the cold, windy Saturday.